The Unley community groups, in particular the Grow Grow Grow Your Own group, of Sustainable Communities SA have been working with their local council on the issue of food security for a while now. The group has been running gardening workshops to increase people’s skills in growing their own food and to create a community of skilled food growers in the Unley Council area. As an offshoot Pauline and Anne have been running a series of free propagation and seed raising workshops. Although each workshop takes a lot of time and effort to plan, both Pauline and Anne light up when they talk about them and the buzz they get from the sharing of knowledge with all the participants. A more sustainable society is one that produces the majority of its food locally. This is clearly not the case in Australia with its largely urban population. Unfortunately a lot of the knowledge and skills needed for successful food production has been declining in the general community over the past few decades. The work that Anne and Pauline and other members of the Grow Grow Grow group are doing is instrumental in re-skilling people in how to grow edible plants. Their vision is to set up and nurture a nucleus of people in each suburb that are confidently growing their own fruit and vegetables. These people can then in turn can teach others these skills. Growing edible plants is not always as straight forward as gardening programs or glossy food magazines would have us believe. Each species has its own needs and quirks and successfully growing a certain species can involve a lot of experimentation. So being able to meet other growers and share knowledge on plant requirements is an important part of successfully growing a range of plants. Nor are the workshops just talk. A core component is the hands on practice that provides that extra level of learning that cannot be gained from reading a book or watching a TV program. Additionally all participants go home with a starter pack of at least one pot of cuttings and several punnets of seeds. 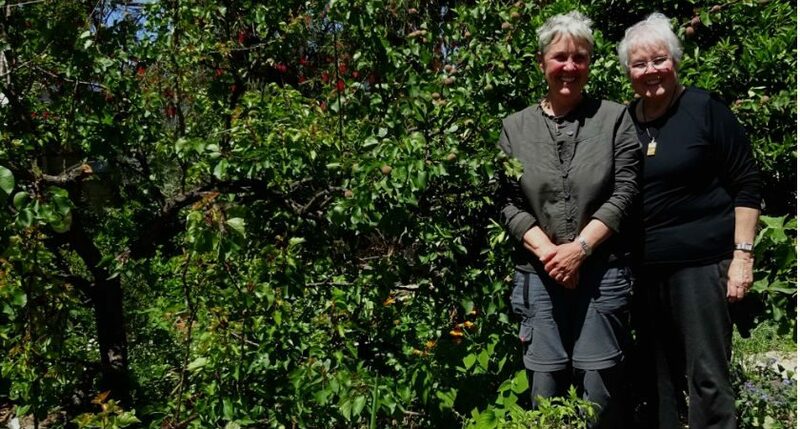 Pauline and Anne started with a series of workshops at the Goody Patch Community Garden and more recently did one the Linde Reserve Community Garden and are planning one at the Joinery later in the year. The structure and content of each workshop is different and is often influenced by questions raised by participants of previous workshops. As I sat talking to them Pauline and Anne started discussing ideas to lengthen the sessions, as invariably participants stay chatting longer after the workshop has officially ended, and to include other topics such as seed saving. Their workshops also have a strong and important emphasis on biodiversity, both in the edible plants grown (there is a strong focus on heirloom varieties which is a passion of Pauline’s) and also in co-planting with native plants to attract pollinators and provide habitat for native insects, birds and lizards. Introduced species of flowering plants, such as the daisy family, which attract bees and other pollinators, as well as predatory insects for natural pest control, are also part of the picture. A biodiverse garden is a happy garden for all! The work Pauline and Anne are doing is just one example of the many volunteers out there quietly and diligently working away to create a more sustainable society. Pauline and Anne find that running workshops stimulates more ideas and possibilities and they know are on the right track when a participant happily declares at the end of a workshop “I can have any plant I want now”. This is the first article in a series highlighting the wonderful work Sustainable Communities members are doing. If you would like to share your story with other members email Dinali.